The reviewing process involves a continuous interaction between authors, reviewers, and subject matter experts. 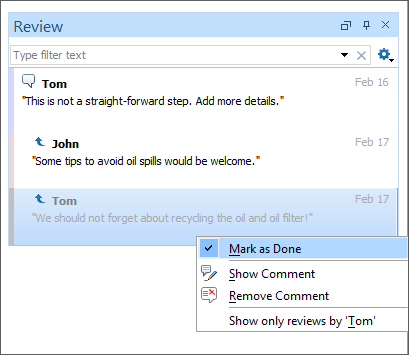 The visual Author mode now allows you to collaborate more easily and effectively with others through comment threads by providing a new reply to comment action and allowing you to mark comments as being resolved. You can collaborate with other members of your team more easily, taking advantage of the improved annotation support. You can now reply to comments added by others and you can also start new comment threads. Everyone that has access to the project can see the comment threads and join the discussion at any time. 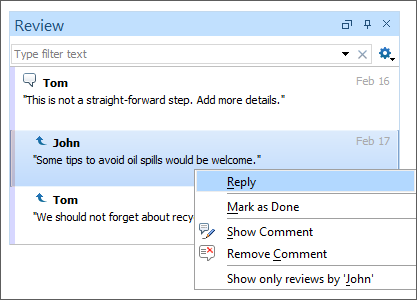 The Mark as done option allows you to mark a discussion thread as being completed. This is useful for marking comments that have been addressed, leaving only those that still need some attention.